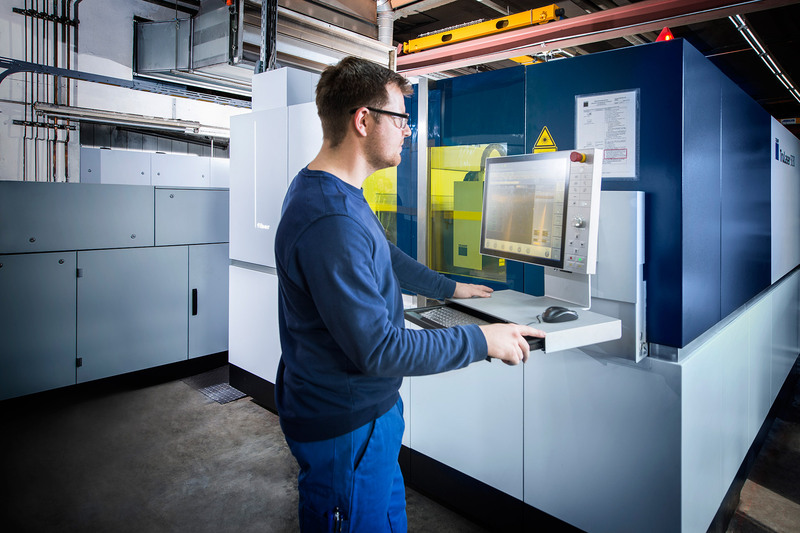 Whether it is laser-cutting or stamping, our modern machinery park provides the ideal conditions for maximum precision and economy. We work exclusively with the latest, internationally -acknowledged technology,, of whose quality and reliability we are convincedhave total confidence in. To produce boards with sheet metal thicknesses of 0.2 mm to 25 mm, we use machinery from Trumpf. We know just how to use the, whose great flexibility, efficiency and versatile application options offered by these machines in a way that is tailored to each customer we know how to use in a customer-specific manner. Thanks to optimised processes, we produce almost every conceivable contour touchlessly with laser cutting. The focussed laser beam continually melts the material. This is possible up to a 3 mm sheet metal thickness with dimensions of 4,000 x 2,000 mm at high speed, so thatwhereby the cut edges remain oxide-free. The minimum gap and high-quality cut edges permit directmean that further processing can be carried out directly. Mild processing by stamping / nibbling, which do not involve any heat, have the advantage, among other things, that the cut edges of galvanised sheet metal preserve their corrosion protection. The complete processing can be done in one set-up. We inform you in one-to-one advice of We can tell you about all the advantages and opportunities offered by our solutions in a one-on-one consultation. We work exclusively with the latest, internationally acknowledged technology, whose quality and reliability we have total confidence in.